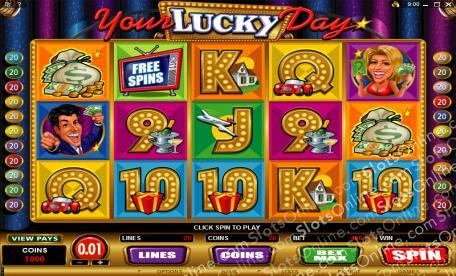 Your Lucky Day is played in front of a live slots fan looking to win a pile of cash. Click here to play! Extra lucky players may trigger bonus games that definitely affect the outcome of the game. Your Host for the game is a wild symbol, and Your Lucky Day is brought to you by any good Microgaming casino. Big jackpot wins may have side effects like unbridled joy, celebratory colorful language, or long shouts of "WHOOOOO!" Now, let's play the best game in town - Your Lucky Day! Everyone playing at home knows the rules. You decide how much you want to wager per line, and how many lines you want to play. You then spin the reels and wait to see if you've won! The more matching symbols that land on one of your active paylines, from left to right, the bigger your prize package. This can be as little as 4 times your line bet for three 9s on a line, to as much as 5000 times the line bet for five Your Lucky Day symbols on the same active payline. Don't forget to watch out for the bonus symbols as well, as they can award free spins and bonus games. What are you waiting for, home players? Hop online to start playing this amazing slots game to see if it is Your Lucky Day! The Host symbol, Hostess symbol, and Free Spins TV symbol are all scatter symbols. The Host on reels 1 and 5 pays out the total bet and triggers the Lucky Money bonus game. The Hostess symbol on reels 1 and 5 pays out the total bet and triggers the Hi-Low bonus game. The Free Spins TV symbol can appear on reels 2, 3 and 4. If two land on the reels, it pays out the total bet. If three land on the reels, it pays out twice the total bet and triggers 10 free spins at double payouts. The Your Lucky Day symbol is wild and it can substitute for any symbol other than scatter symbols. The Host symbol triggers the Lucky Money bonus. In this game, the player must choose from 18 symbols. The first choice reveals a prize amount, and the second choice a multiplier value. The Hostess symbol triggers the Hi-Low bonus. In the game, the player chooses whether each of a series of cards will be higher or lower than the last card. The prize multiplier increases as you guess correctly, paying out on your total bet amount. 1 correct guess pays a 5 times multiplier, 2 correct guesses pay a 10 times multiplier, 3 correct guesses pay a 15 times multiplier, and 4 correct guesses pay a 25 times multiplier.